Treat the foodie in your life with one of these artisan Hampshire gifts. Simply order online or visit your local farm shop or independent retailer where many of the items are stocked. From condiments to liqueurs, there is a tasty treat for all food lovers. What's more, they all come in at £25 or under. Gin, Rock Sea Vodka and HMS Victory Navy Strength Gin, the lucky recipient will be inspired to mix up the festive season. Family-run Summerdown Farm in Hampshire has been growing, harvesting and distilling peppermint oil for over 20 years. They specialise in Black Mitcham peppermint which is renowned for flavour, aroma and therapeutic benefits. This special gift box contains luxury peppermint truffles, heritage crisps, heritage creams and award-winning pyramid tea. Perfect to send as a Christmas gift or give to your festive host. matched with white meat, salmon and even raspberry cake. Make the meat lover in your life smile with a jar of Hampshire biltong. Made locally with top quality beef using traditional techniques, this nutritious snack delivers on flavour. Choose Traditional, Peri Peri or Moorish and you will receive 500 grams of this delicious snack in a glass jar. Inspired by their surroundings, Beaulieu Chocolate Studio has created a gift box containing New Forest Bark Chocolate. This is just one of the novelty sweet treats available on their website, all made by hand. If you are in the area then visit their shop where you can see the chocolate making process. This beautifully presented gift pack contains four delicious vinegars which have all been given Great Taste Awards. Made on the Isle of Wight using locally sourced and simple produce, these versatile vinegars are loved by chefs and can be added to dishes, used in dressings and even mixed in cocktails. Already packaged as a gift you can send directly to the recipient and save yourself a wrapping job! Imagine a coffee liqueur that delivers a top quality flavour without all the usual flavourings, colourings and thickeners. Made with locally roasted coffee, Conker’s Cold Brew Coffee Liqueur is perfect served over ice or add a measure to your gin and tonic for the turbo version! Any budding chef would welcome this box of goodies to their larder. The gift pack includes 50ml bottles of Rosemary & Garlic Infused Oil, Chilli Infused Oil, Lemongrass & Thyme Infused Oil, Pure Rapeseed Oil and White Truffle Oil. Each bottle comes with a description and suggestions of how to use it. In the heart of the Candover Valley, Moonroast Coffee is expertly roasted by the Bradshaw family. Choose from their vast selection online or give the gift of experience and book a roastery tour. Price: coffee from £6.20, roastery tour £12 per person. Mead is recognised as the oldest alcoholic drink in the UK. Chalice Mead is made in a way that respects its roots but adds a modern twist. Choose from flavours including Caramel, Chilli, Rhubarb, Nettle and Orange. 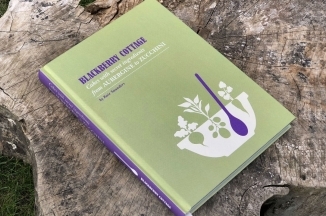 Enter to win a copy of the Blackberry Cottage Cookbook, Cakes With Secret Ingredients.